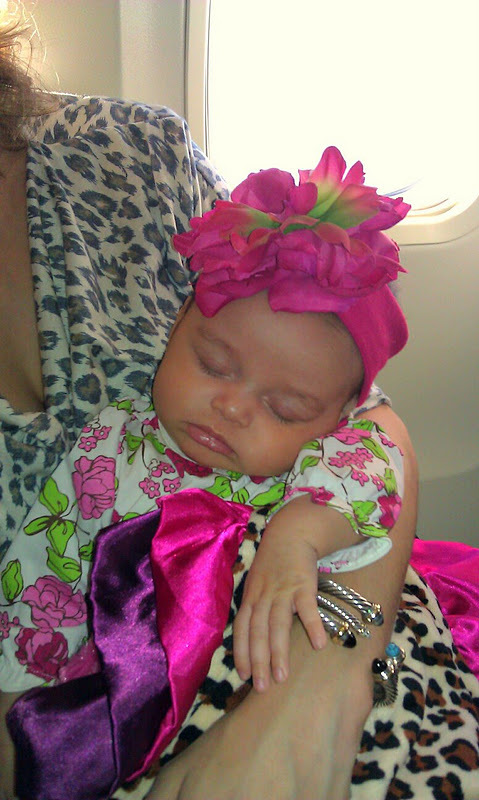 Last week Josselyn went on her first airplane ride at 10 weeks old! Most of you know that I have a small styling company called Tres Chic. My business partner (Lauren) and I take seasonal trips to Midland, TX every few months due to our large clientele base there. Well, this last trip was definitely one of a kind. First of all, I had never traveled anywhere with my little princess yet! Josselyn can be a bit of a handful at times & John was not going to be able to fly to Midland with us because of his work schedule, so that equation (traveling + baby - dad = possible disaster). And unfortunately Josselyn still will not take a bottle! It is absolutely crazy and yes I have tried EVERY BOTTLE known to man. Well, there was no way I could visit 10 clients in 3 1/2 days and make time to go feed Josselyn every 3 hours, so my sweet friend Christina/Josse's favorite babysitter came along to help take care of Josse & bring her to me every 3 hours to eat! All of this to say I did have help but traveling with an infant is still no joke! We had to lug each of our purses, my laptop bag, a diaper bag, stroller & baby through security & onto the plane. In my head I was hoping that some miracle would happen and Josselyn would decide to take a bottle on this trip so I brought along 2 bottles & 20oz of frozen breast milk in a little cooler as well. Apparently frozen breast milk is still considered a liquid (which I should have know) and since I did not take the breast milk out of the diaper bag my entire diaper bag was searched & I had the pleasure of having that dumb wand trace my body (Come on airport security do you really think Josse and I are terrorists?!?!) I guess it is better to be safe then sorry. Anyways, after we got tons of dirty looks because it took forever to get through security we finally made it to our terminal. Now luckily Christina was with me becasue I have no idea how I could have held all the stuff I was carrying plus a baby and then take my stroller in and fold it up MYSELF so they could stow it underneath before boarding the plane (no one helps you do that!). Christina and I could barely manage it all let alone one person and for some reason people stare at mom's with infants instead of offering to help! Well, once we were finally on the plane I was prepared for the worst. You see, I am not going to lie...My daughter is a sweet, little angel but that does not mean that this little angel does not have periodic melt downs lol. When I am driving from point A to point B, Josselyn may be quite as a mouse or she might sleep like a little angel or she may decided to scream bloody murder, hold her breath & turn various shades of purple (& I am not exaggerating). So, I was prepared for the worst case scenario on this 50 minute flight. To my surprise my daughter was PERFECTLY BEHAVED (I was honestly shocked!) She just sat in my lap smiling at everybody and then half way through the flight she just fell asleep!!!! Ummm....Josse never just falls asleep! Some how she has trained mommy to bounce, sway & pat her all at the same time and then she will close her eyes and doze off. I was amazed at how well behaved Joss was on her first airplane ride! I could not have been a more proud mama :) This must have not been just luck because my daughter was just as perfect on the flight home YIPEE!!! Sure, she may have cried for 30 minutes in her car seat from the airport back to our house but she was a little angel on that plane ;) So yah, it is a little extremely awkward that I had to have someone bring Josselyn to where I was at between clients to feed her in the car! And believe me I was stuck feeding her at some random places like: various neighborhoods, the Hobbly Lobby parking lot, multiple restaurant parking lots, church parking lots, etc. But hey, I have to count my blessings, at least Josselyn is a little angel when she is flying high! We had quite the adventure on our first mommy/daughter trip together & I can't wait to go on more of these adventures (I just hope Josselyn will be drinking a bottle on the next one). PS We will be going to NYC for Thanksgiving & I am keeping my fingers crossed that little Miss Josselyn will be just as well behaved on that 3 hour flight! The good news is John will be traveling with us so hopefully that will make the security line & loading the plane a little easier! Josselyn meeting her cousin Lucas for the first time in Midland!